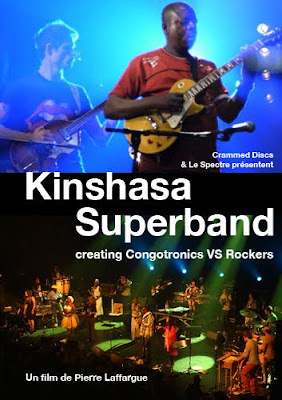 Following on from the DRC Music Kinshasa 1.2 concept LP dropped last year by Damon Albarn, Warp Records & Oxfam, there now comes a new musical documentary 'Congotronics vs. Rockers' an evolving cast of 10 Congolese musicians and 10 members of various indie-rock bands who've come together to record and play live gigs across the world. Filmmaker Pierre Laffargue has chronicled the Superband - which includes members of Konono N°1, Deerhoof, and Wildbirds & Peacedrums plus Juana Molina and others..A project conceived by Marc Hollander and Vincent Kenis from Crammed Discs in Belgium.Here's the first glimpse of the promo Reel. Here you check out the Congolese members of the live group on their way to last years Fuji Rock festival in Naeba, Japan.